Re: Not AQ related but this is where the industry is going..
Hmm... where exactly could a multicopter (like the one pictured) deliver packages to? A heliport? Hover outside the window and knock? Land in the street? Sounds like marketing hype, poor reporting, or both. One day this will be a reality, but regulators would have to be crazy or negligent to have something like this product flying over urban areas. for your information, flight regulation exists for RemotelyPilotedAircraftSystems (RPAS=anything remotely controlled and doing a job while flying) here in France and is spreading in european countries and worldwide and as a result you can hardly fly anything close to cities or people nowadays. So this kind of scenario is very unlikely to happen. I concur with Bob...delivery in populated areas is not gonna happen anyday soon. Not because of technical limitations, but because of legal limitations...having gone through the process of certifying AQ copters for commercial use here in DK and beeing a member of the Danish advisory board on civilian UAV´s, I dont see any kind of regulation on the horizon that will allow use of crafts bigger than 1500 grams in populated areas. "The craft weighs less than 1500 grams total flying weight and is capable of staying fully maneuvreable with 1 rotor out." From 1500 to 7000 grams, they are classified class 1b and can only be operated in urban areas with a special dispensation. Crafts in class 1b and 1a has to be operated VLOS - flying BVLOS requires special certification, transponders, etc. We are not yet certified for BVLOS operations. From what I know, Denmark has very liberal rules on civilian autononomous aircrafts. Its more than likely that when PAN-EU rules are worked out and implemented in 2016, rules will be more restrictive and further type-certification will be imposed. 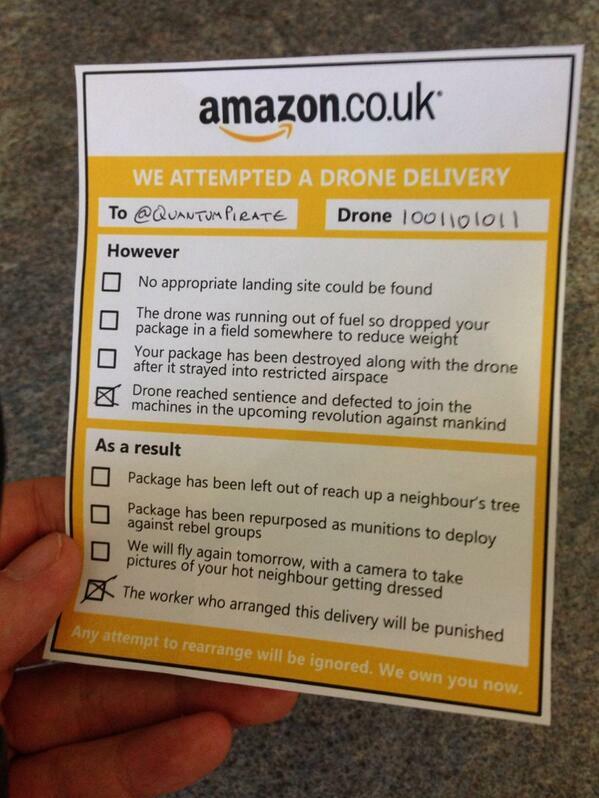 Did you guys see the Amazon "Prime Air" hype? Bezos is now dispensing the coolaid as well. http://www.amazon.com/b?ie=UTF8&node=8037720011 I mean if anyone can make it happen then Bezos/Amazon are a good bet, but... really? "From a technology point of view, we'll be ready to enter commercial operations as soon as the necessary regulations are in place." How absurd. Nice video they have though... if you overlook about a zillion little details they glossed over. I'm just glad the kid was inside when the thing landed on their porch. Yah, they know how to start a hype - but they obviously know notten about MRs.
Wheather conditions, obstacles, flight time, redundancy are only a few concerns. They should also use some grey matter on an anti-theft system for both the packages and the craft - plus an S&R service for lost copters.